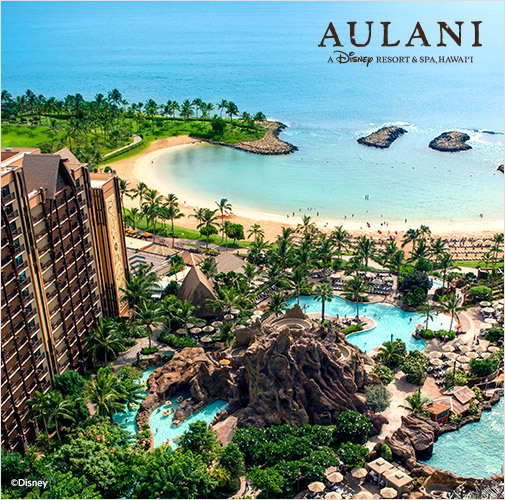 Book a flight + hotel package of four nights or more at AULANI, A Disney Resort & Spa in Oahu^, and save up to 30%* on your hotel stay. Round trip flight via Southwest Airlines® to Honolulu (HNL). ^Service from Oakland to Honolulu begins 3/17/19. Honolulu to Oakland begins 3/18/19. San Jose, CA, to/from Honolulu begins 5/5/19. Seats, travel days, and markets limited. *Hotel savings vary depending on length of stay and room category booked. Four-night minimum stay required. Hotel offer is not valid in suites or 3-Bedroom Grand Villa room categories. Save 25% in Poolside Garden View, Island Garden View, or Standard View room categories. Save 30% in Ocean View or Partial Ocean View room categories.